Emily Field is not your average registered dietitian! 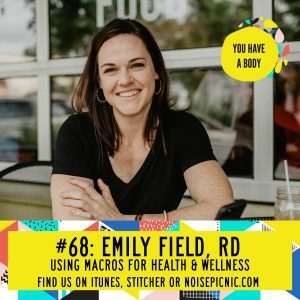 Emily is all about real foods and how they work in our bodies, and teaches women how to use balanced eating approachs so they can finally break up with depriving diet behaviors and nonsense food rules for good. Through flexible dieting, tracking macros and tailoring nutrition around effective exercise her clients are enjoying more food, feeling stronger, leaner and more confident than ever before. What could be better than that, right? Liston on as Hannah and Lucia pick Emily’s brain about women’s relationships with food (and men, too! ), her favorite “I can’t live without this” food, how she meets clients where they’re at and joins them on their journey towards a more fulfilled food like, and so much more. Emily works one-on-one with clients through online coaching, offers digital courses and products, and offers group coaching experiences. Like what you’re hearing? Great! Leave us a review iTunes and we’ll send a personal shout out to you!